the lip-locked couple in front of your locker to move? Did you say, Excuse me, tap them gently? pushes hallway lockers open with gale force. we all get a good, fluorescent look at each other. 1. Not only are you a contributor to 32 Poems, but you are also a professor at Virginia Tech and you are completing a doctorate in Religious Studies. What “hat” do you find most difficult to wear and why? Right now the hardest of these–between teaching in a relatively new job, trying to write poems during the semester, reading all the applications to our MFA program, advising students, and mothering a toddler–is finding the time in the day to work on my doctoral research. Happily, that’s what they make summers for. It’s also hard to peel off my professor-identity, in the sense that when I meet with my religion professors, I have to inhabit my role as a student again. It’s humbling and good for me though–it reminds me, on a fairly regular basis, of how my own graduate students feel. 2. Your biography mentions that your grandparents survived concentration camps in Auschwitz, Ravensbruck, and Mauthausen. Have those stories and experiences influenced your poetry or writing? Please Explain. I think the way that my grandparents’ experiences have influenced my work the most is that there’s always been this deep well of silence around my family history. My grandmother didn’t start talking about the war and her experiences in it until well into her 80’s, when different foundations started coming around with video cameras to record survivors’ stories. Until then–until I was in college–I had never heard about her war experiences. When I was little, she used to tell me that the numbers on her arm were her phone number, written there so she wouldn’t forget it. Part of me writing about her in my first book was, I suspect, part of my concerted effort to combat that silence. But she also had a real streak of black humor, and I definitely think that shows up a lot in my work as well. When I write about uncomfortable or difficult situations in my poems, I tend to temper them a bit with small moments of situational humor, to give the audience that permission to laugh. She passed away, though, on Mother’s Day of last year, so I’ve been writing elegies to her that take various forms. One of them, “Godspeed,” just came out in the most recent issue of Washington Square. I’m obsessed with Easter candy–particularly slightly stale marshmallow peeps. I think of peeps as sort-of guardian angels–the bunnies just look so benevolent, kind, and wise. I keep them everywhere. I have boxes of them that students have given me as gifts taped to my office wall; I have a yellow stuffed-animal bunny peep in the cupholder of my Civic who functions as a co-pilot of sorts. I realize this is weird. I also often gift people with peeps. 4. Most writers will read inspirational/how-to manuals, take workshops, or belong to writing groups. Did you subscribe to any of these aids and if so which did you find most helpful? Please feel free to name any “writing” books you enjoyed most (i.e. Bird by Bird by Anne Lamott). When I teach poetry workshops, I love to use Steve Kowit’s book In the Palm of Your Hand. I find outside mini-research projects much more inspiring though, in terms of my own work. I’m currently really into Robert Smithson’s work, especially his essays. Also, Joshua Lutz’s “Meadowlands” photos, and a book by Iain Borden called Skateboarding, Space and the City. In terms of my own writing process, I currently belong to two virtual writing groups. One is constant, and it’s a password-protected blog where a few other poets and I post exercises and the poems that we write from them. This tends to get more active when the semester gets less busy, as most of us teach. I have another virtual group that’s a closed Google group. We pick 2-week or month-long chunks about twice a year to meet online, and when we meet, we write intensely–usually a poem-a-day. It came out of the NaPoWriMo idea, but we usually tend to meet in the summer for a month, and over winter break for a few weeks, as again, most of us teach and April (which is actually officially Poetry Month) tends to be too hectic in the academic calendar for anyone to get much writing done. We don’t comment on each other’s work, but I think we all like the group accountability of these virtual communities, and the fact that they help mitigate the loneliness of plugging away on your own a bit. 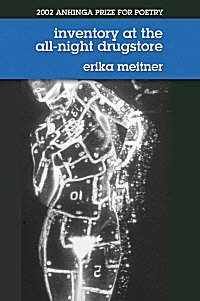 Erika Meitner attended Dartmouth College, Hebrew University on a Reynolds Fellowship, and the University of Virginia, where she received her M.F.A. in 2001 as a Henry Hoyns Fellow. 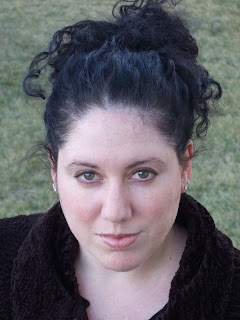 She’s received additional fellowships from the Virginia Center for Creative Arts (2002, 2004, 2005, 2008, 2009), the Blue Mountain Center (2006), and the Sewanee Writers’ Conference (John N. Wall Fellowship, 2003). Her latest book is Inventory at the All-Night Drugstore. Want to find out what Erika’s writing space looks like? Find out what she’s working on now, her obsessions, and much more. Check out the rest of my interview with Erika here. 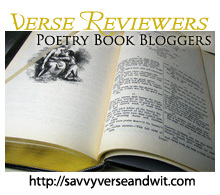 Please feel free to comment on the 32 Poems blog and Savvy Verse & Wit.